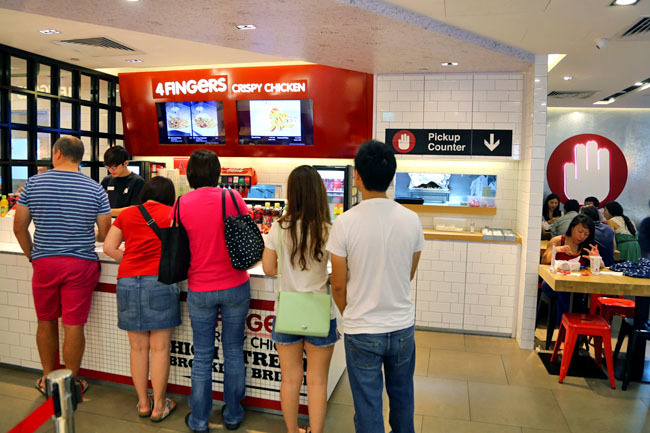 4 Fingers Crispy Chicken at Ion always has a long queue. BUT, it could be also because it is only one cashier working most of the time (even though there are two counters), and the service is generally slow. Well, does not quite qualify to be called ‘fast food’. People will still wait for an average of 15 to 20 minutes to get their 5 fingers, I mean hands on these Korean style fried chicken. 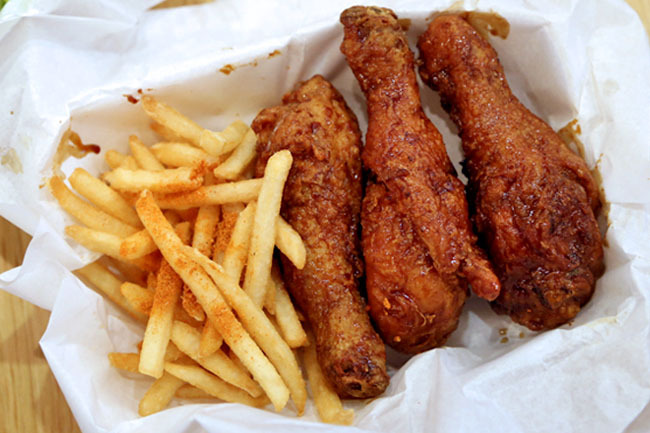 Korean fried chicken differs from typical American style fast-food fried chicken as they are usually covered by a layer of sauce or spices, and is being fried twice. The skin is usually thinner, crunchy and less greasy, and therefore more pleasurable to eat sometimes. 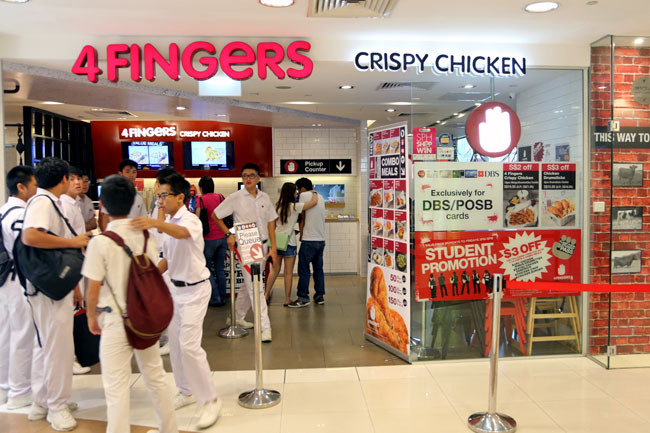 The speciality is the 4 Fingers Crispy Chicken Wings and Drummettes (6 pieces for $9.95) coming in flavours of soy garlic, spicy or mixed. Seriously speaking, the seasoning is very tasty and you would want to slowly lick the sauces off the skin. The chicken though, felt like they went for an extended sun-tan session, and were dry and shrivelled. Probably meant for a snack-like food. 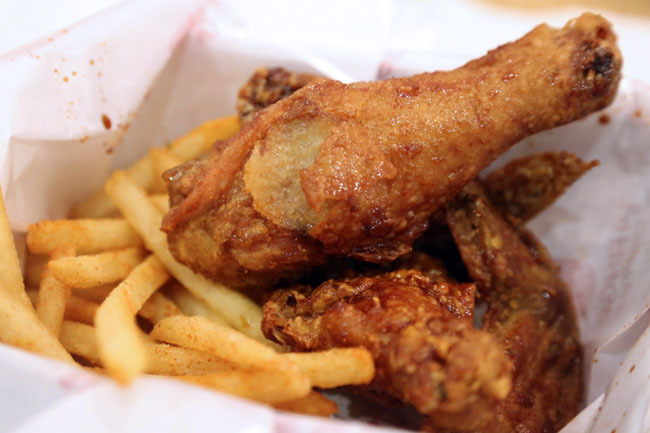 If you want juicy, moist and piping hot, then order the Chicken Drumsticks (3 pieces for $10.95). Because after you bite through the crackly skin, you do get steam coming out from juicy chicken meat. Between the 2 types of fries, I found the seafood have a more impressionable taste than the kimchi flavoured. 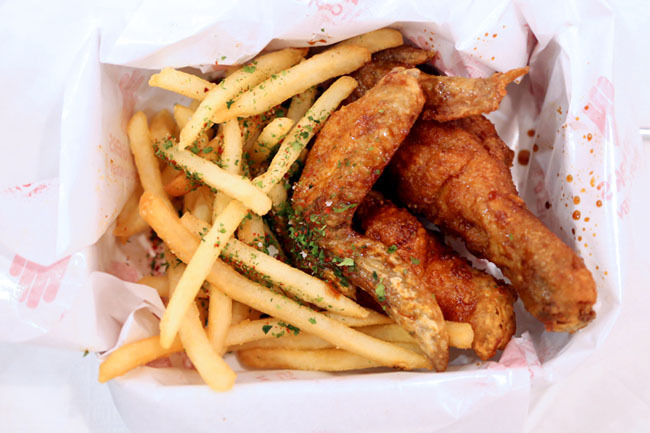 Most call 4 Fingers Crispy Chicken one of the best Korean fried chicken in Singapore, and only Chicken Up can beat it. What do you say? While I genuinely enjoy the marinates and drumsticks, one wishes that they would do something about their consistency and queue system. 4 Fingers is still new in the Philippine market but I actually like it. 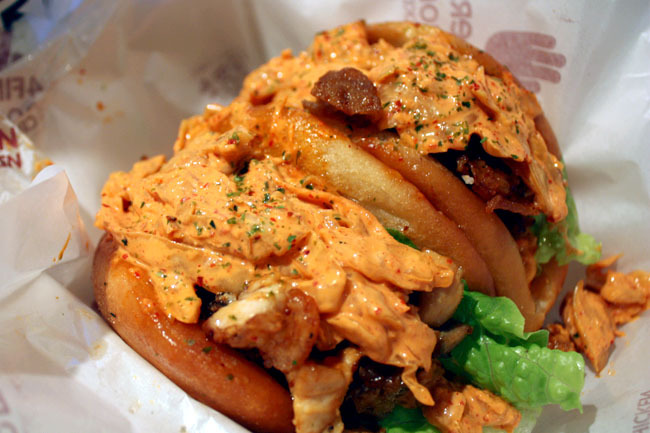 Although most people here prefer Chicken Bon Chon. They only have a few branches here and I’m hoping they will expand soon. You are luckier because they operate until 1030 pm. In my country, most shops and restaurants close at 9 pm. PS When you mentioned Doby Ghaut and Ion Orchard, I suddenly missed SG. If my funds will permit, I’m looking forward visiting your country again. Ah, I see. I wished both would open more branches here too. I don’t teach yoga. Eat everything in moderation – don’t torture yourself. There is a new outlet at West Gate Jurong East. You right about the one cashier concept, I feel that it’s a marketing gimmick! not a fan of their chicken, it tastes too strongly of MSG, even though it is quite crispy and juicy! Can i know whether any delivery on CNY 21/02/15, If yes how do i go online for delivery.